If you have a relative in hospital and they need ongoing care, you may soon come under even greater pressure to get them out before the proper NHS Continuing Healthcare assessments in hospital have taken place. NHS England has issued new guidance to CCGs regarding hospital discharge and Continuing Healthcare assessments. It means that CCGs may now do whatever they can to avoid assessing people while they’re still in hospital. The new guidance comes in the form of a letter sent by NHS England to CCGs. It’s dated 17th August 2017 and you can read it here. We’ve pulled out a few points from the letter and added our comments and words of caution below. The focus of the letter is, on the surface, about making the NHS Continuing Healthcare assessment process more efficient. However, it may make things even more difficult for families. You may come under enormous pressure to get your relative out of hospital. If you can stand firm and insist that the NHS Continuing Healthcare assessment process takes place while they are still in hospital, you will have more leverage to get it done quickly. If/when your relative is discharged, they may be offered intermediate care (rehab) – if that’s appropriate for them. Your relative should not be charged for this. At the end of the period of rehab, and if your relative still has ongoing care needs, there should be an NHS Continuing Healthcare assessment. Again, your relative should not be charged a penny for any care until this process is complete – even if they have left rehab. If intermediate care is not appropriate and, for example, your relative is going straight into a care home or having ongoing care at home, you do not have to pay a penny in care fees until the NHS Continuing Healthcare assessment process is complete. It doesn’t matter whether the assessment process takes place inside or outside hospital, the NHS has a legal duty to cover all the costs of care until it is complete. Guidelines do not negate the law. The last few words here contradict existing guidance and are, frankly, alarming: NHS Continuing Healthcare funding is for any stage of life. It doesn’t have to be ongoing; instead, it can be provided during those times when a person’s care needs meet the criteria, and then cease if/when the person no longer needs it. So, saying that people who don’t have long term care needs shouldn’t be assessed at all would seem to mean that anyone recovering from illness or accident (and who is actually recovering) would never get the funding. This must surely be in conflict with the whole legal basis on which the NHS operates, i.e. to provide healthcare. CCGs may be more reluctant to do Checklist assessments in the first place. Stand firm. Read about the typical mistakes made with NHS Continuing Healthcare Checklists. The scores in Checklist assessments may be lower than they should be, essentially to avoid the need for the CCG to do full multidisciplinary team (MDT) assessments. This is essentially the same as before. However, remember that part of the purpose of the NHS Continuing Healthcare assessment process is to inform the kind of care that is required. If people are being shunted out of hospital without a clear ongoing care plan in place, this presents a huge risk to patients. NHS Continuing Healthcare full MDT assessments being arranged in haste without families being informed. NHS Continuing Healthcare full MDT assessments being carried out so quickly that they do not reflect the true picture of need of the individual being assessed. A lack of proper evidence at assessments, because the time it takes to pull it together may mean the CCG does not complete the process in the required time. This may all sound cynical, but there is already a huge amount of impropriety in the way NHS Continuing Healthcare assessments take place (or don’t take place); these extra requirements placed on CCGs risk making this even worse. Guidelines are just guidelines; they are not the law. 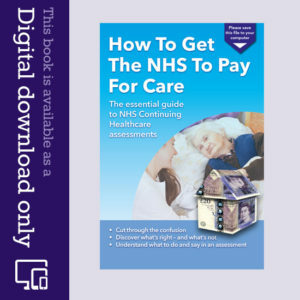 Whether or not a person pays for care has nothing to do with their money, house or assets; it’s about their care needs only – and the decision about who does actually pay can ONLY be made once the NHS Continuing Healthcare assessment process is complete and a finding decision has been made, in writing, and with a full rationale. The local authority has a vital role to play in the NHS Continuing Healthcare assessment process. So be vigilant, stand your ground and don’t be afraid to dig your heels in and get the Checklist carried out while your relative is still in hospital. Read more about hospital discharge and NHS Continuing Healthcare assessments. That’s great news, Kirstie – well done for persevering. Thank you also for your very kind words about the website. That’s really kind of you, and I’m glad it’s a useful resource. Wishing you well. My mum is in hospital after falling in the care home she lives in. The home are saying they don’t want her back as her needs have changed and she now needs nursing care. The hospital have told me that they no longer do NHS Continuing Healthcare assessments in hospital. We had one arranged for 12th January – this was arranged before she had her accident. The discharge team tell me there are no assessments in hospital anymore and mum will need to go to an assessment bed in a home of their choice. The social worker says they can be done in hospital, not sure what to believe. My mum is self funding. Can you offer me some advice please I would really appreciate it. Many thanks. We had the Multidisciplinary Team (MDT) a few weeks ago, what happens if the majority (namely the sister of the ward and the social worker) say my Dad’s primary need is health, but the Continuing Healthcare coordinator says otherwise? There was no decision made at the MDT, I am told that a decision will now be made outside of an MDT. The Multidisciplinary Team (MDT) must agree a recommendation. If not, the highest should become the recommendations. The Decision Support Tool (DST) with the default recommendation must be used by CCG decision makers to make the decision. Only in exceptional circumstances can the MDT recommendation not be accepted. He was in a Nursing Home however there is a safeguard alert in place he was in receipt of Funded Nursing Care but am I right in staying that this amount of money could not possibly cover the amount of nursing care he needs. Please could you advise me on intensity and nature, so that I can prepare my argument. The funded nursing care payment is a sop to make you go away. It is arguable that needing this funding indicates that Continuing Healthcare (CHC) funding including accommodation costs is really required. Also… Don’t let them get away with ignoring the Framework regarding the part about Deprivation of Liberty Safeguard (DoLS)…. DoLS is supposed to be assessed even though assessors will try to misuse what is written. Consider for a moment that a social service dept cannot provide accommodation if it is ancillary to the nursing needs. Without somewhere to accommodate someone….. How can they have their liberty deprived? As for ‘Intensity’ That is the amount of effort required to meet the needs….. How many people, how often, is it repeated because of failure, Do other domains (Challenging Behaviour) interact thereby making perhaps, mobility needs, more intense? To explain…. My mum was highly mobile. However she was also very aggressive for a long time…… Being scored low on mobility actually endangered patients and staff….. Challenging behaviour had to be scored ‘severe’. As the Independent Review Panel (IRP) chair eventually understood…. ‘Mrs X’s care needs were not being met in a vacuum’ And, ‘her challenging behaviour became more of a risk because of her good mobility’. ‘ ’Nature’ is about the characteristics of both the individual’s needs and the interventions required to meet those needs. just been sent the Checklist.. Deprivation of Liberty Safeguard (DoLS) is not taken into account because he is in hospital the DoLS is no longer valid. The assessment took place at his Nursing Home. The ward have not requested a DoLS. DoLS can actually be instigated and enforced within a hospital….. I hold a copy of DoLS created by a social workers within my local hospital for my sister in law who was mentally ill upon admission. So what they told you is $%$£$%^……. Remember that anyone lying in a financial matter is potentially committing a criminal offence. (This is about who pays. Fraud is the offence). Let them know in strong terms……. That you will not accept a lie and give them the get out of making an error only if they will correct such. Hospitals are hopeless in this regard… To explain….. My hospital claims 435,000 people came through casualty in one year……… (Other sources indicate a massive number of casualty admissions are mentally ill)…… Yet out of that number and those admitted without casualty involvement, there was only 11 times that an IMCA as requested to assist with treatment and decision making. One can also request an IMCA at a DST/MST assessment too. We have done it in the past to ensure that Challenging Behaviour was stressed sufficiently and by an expert. The service is free and once provided by the council is now for the most part a little known about, outsourced resource. If a DoLS is in existence, then the hospital has a legal duty to comply with the terms of the document. Regardless of if they have forgotten to ask about it and to see a copy. It is their responsibility to provide the correct care for the patient. Not for the (non cognitive) patient, to demand it at every turn….. DoLS is about keeping someone safe and those around them too. “they will say his needs are being met”, “DoLS is not taken into account”, “he is stable”. I am tempted to ask for the list of the nursing needs he is currently receiving/ needing verses the list of social care needs he is currently receiving/needing . He remains in hospital the social worker to date had not yet met my dad, I am intrigued to know the outcome of his assessment. Also is it worth taking in a pen picture of what he was like before he had his stroke as the only people that know dad would be my mum and myself at the Multidisciplinary Team meeting on Friday? Hi Kirstie….. There is no such thing as a social care need within the National Framework. The description states quite clearly that it is undefined. It has no actuality in law. Look at the Framework’s description of social needs at page 50:- (PS. I’m not shouting, I just cant use another font to split mine from theirs). NOTE THE WORD ‘FOCUSSED’. FOCUSSED IMPLIES THE ELIGIBILITY CRITERION OF ‘INTENSITY’….. FOCUSSING ATTENTION OR LIGHT MAKES IT MORE INTENSE. FRAMEWORK REQUIRES ANY ACTIVITY CARRIED OUT AS CARE TO BE TESTED AGAINST THE ELIGIBILITY CRITERIA. I WOULD ASSUME THAT ‘VULNERABLE SITUATIONS’ MEANS THAT THEY ARE STILL LIVING IN SIMILAR ENVIRONMENTS AS YOU DO. – helping them to manage complex relationships and (in some circumstances) accessing a care home or other supported accommodation. 2.3 Social care needs are directly related to the type of welfare services that Local Authorities have a duty or power to provide. These include, but are not limited to: social work services; advice; support; practical assistance in the home; assistance with equipment and home adaptations; visiting and sitting services; provision of meals; facilities for occupational, social, cultural and recreational activities outside the home; assistance to take advantage of educational facilities; and assistance in finding accommodation (e.g. a National Framework for NHS Continuing Healthcare and NHS-funded Nursing Care home), etc. CCGs should be mindful that where a person is eligible for NHS continuing healthcare the NHS is responsible for meeting their assessed health and social care needs. SO UNDER CHC FUNDING ALL NEEDS HAVE TO BE PROVIDED/PAID FOR. THEREFORE SEPARATING ANY NEEDS OUT OF THE ASSESSMENT AND ONLY REVIEWING THOSE THAT ARE LEFT, IS WRONG. AS IS COMPARING SAY, SIX SOCIAL CARE NEEDS WITH THREE HEALTHCARE NEEDS AND THEN STATING AS HAPPENED TO US, ‘THE HEALTHCARE NEEDS DO NOT OUTWEIGH THE SOCIAL CARE NEEDS’. So, as predicted the Multidisciplinary Team was a shambles ! The representative from the CCG had pretty much made up her mind that she assessed my dad as Moderate on most domains. The Local Authority disagreed that my dads primary need was social however she was adamant that it was. I mentioned Coughlans law & read Pamela’s care plan to her, she laughed!! Spoke over & interrupted us showing no respect! The end result was no result she asked for more evidence from nursing staff and said it would need to go to panel !!!! Oh and regarding Deprivation of Liberty Safeguard (DoLS)….. Get a copy and have a look at it. It is normal for the social services to slightly overemphasise the needs that allow the decision to deprive someone of liberty. Get it amended if needs and reasons are missing. To under emphasise needs in such a document might well lead to a challenge of their decision to effectively place someone under house arrest and that could see someone in authority undergoing a similar fate. That all being the case, the NHS/Social Service will usually try to under emphasise the same things to avoid Continuing Healthcare (CHC) funding. What they are basically writing is that there simply being a DoLS means nothing…… It is up to you to ensure (regardless of assessors trying to ignore it), that the damaging content of the DoLS is used against them or to inform them that the the DoLS becomes illegal because it is obviously (in their minds), an unnecessary action and document. For others reading…. Ensure that DoLS records are made a comprehensive as possible. It does help to have an official document quoting complex, intense and unpredictable needs to allow the locking up of another human being on hand when the same people working with the NHS then try to back track to avoid acknowledging the same person’s needs and forcing them to pay for the ‘prison’ as it were…..
Care home must have a copy….. Or they break the law by acting on something that they cannot confirm to an outside party charged with investigating or monitoring their activities. The council usually construct the Deprivation of Liberty Safeguard (DoLS) and must hold a copy too. Have a look at a copy….. Compare it with your observations and the care home notes. You might well note needs that will be dismissed at the Multidisciplinary Team (MDT) and supported too by the Social Service rep’ whose personnel were responsible for ensuring that the DoLS was sufficiently ‘bad’ to properly confirm deprivation of liberty. Search for other similar needs that might require the DoLS…… Get them added to it with all of the adjectives that describe. Even if the current needs seem a little unexplained, then get the explanation included (again, along with the corresponding adjectives). Then ask the MDT what they reckon the part of the Framework actually states when they try to ignore the DoLS…… Look up a definition (and synonyms) of the words used and rewrite the section to make every day sense. Then warn them that they are making an error in procedure by ignoring a relevant report. Sorry Barry, I keep having thoughts on this. It is the contents/reasons for the DoLS that will assist in challenging the completion of the DST. So they will make a load of observations about ‘challenging behaviour’ and then try to lower it from ‘severe’….. If it is not severe then why the DoLS? Why the wording of the DoLS? Is the DoLS true? Has someone lied to create the DoLS? Has someone effectively unlawfully imprisoned your loved one? What will the Police say when you report such false imprisonment? Can they really have it both ways? Can they really state that the health care needs are sufficient to remove liberty but are not severe enough to require a paid for place in which to be deprived of liberty? As Jackie is in our own home do we still need the DoLS? The DoLS is a relevant report that actually has legal status. Imagine a copper trying to get someone imprisoned without any evidence….. It would get thrown out. Everything else within a MDT assessment and the subsequent decision is based upon observation and often poorly kept evidence (care home notes and the assessor’s 5 minutes with the patient). The contents of the DST are also subject to ‘professional opinion’ too. The DoLS must demonstrate sufficient evidence to effectively lock someone up and to keep them there. (And/Or provide means for frequent personal intervention and monitoring. Complexity/intensity/unpredictability?). My argument is that one cannot be deprived of liberty without a ‘prison cell’ so to speak. No other person in the UK pays for such incarceration….. why should the sick elderly and the mentally infirm? Hi Chris-G we had the revue and they agreed to funding for another year, but you were right on the behavior score we had Severe and they down scored it to High then said we need Deprivation of Liberty Safeguard (DoLS) ,so i said who does that and the Continuing Healthcare (CHC) assessor said we do, so again we are at home in our own house. So I said why do you need the DoLS, she said because you use a lap-belt on the commode and bumpers on the bed which is a restriction of her liberties, Jackie got a Severe in Cognition. We had a review with Continuing Healthcare (CHC) and at the end they agreed to continue for the next 12 months, but then they said we will do a Deprivation of Liberty Safeguard (DoLS). We are living in our own home, so I contacted the DoLS team and they said it is normally only for people in hospital or in a care home. So I asked would the Local Authority be able to do it and they said they would have to apply to the Court of Protection. So why would CHC need to do a DoLS? What would be their ulterior motive – as we have been together for 60years and I am her main 24 hour carer? Hi Barry, good news and congratulations about the funding. Deprivation of Liberty Safeguard (DoLS) can take place at home due to any restrictive care needs being required. I doubt that it takes a court of protection involvement. That sounds like more nonsense. You must consider that apart from you, others might be involved in Jackie’s care and they have to have a legal footing to carry out their tasks without someone else later arguing that what they did was illegal deprivation of liberty….. To argue a one off was required is easy….. To make a habit of it requires the DoLS. This can apply to you too if anyone tried to criticise your necessary actions. Many Thanks, so do you think it is a good idea to let them do a DoLS, is there anything you can think of for me to watch out for that they might overlook or forget to mention. They pay for two carers to come in everyday for three hours from a reputable company, the rest of the time I am her 21-hour carer. It’s just that she was diagnosed in 2008 and now they want to do a DoLS. When she was diagnosed she made me promise I wouldn’t put her in a home, I will keep that promise and look after her till the end, not for money not out of duty, but because I still love her, being registered as end of life and bed bound because everything has gone, what’s the point now of a DoLS . Let them do the Deprivation of Liberty Safeguard (DoLS). If done comprehensively it might give you ammunition to try to gain more hours of care. As for overlooking something……. Every need that is carried out to a totally bedbound and non cognizant patient is in my mind covered under DoLS. Now what needs to be questioned is why you have to work 21 hours a day to provide the rest of the care to someone who is effectively incarcerated. I very much doubt that such a situation is legal….. I can’t imagine the outcry if nurse or doctors had to work or to be on standby 21 hours a day, 7 days a week. Misread your post……. So my last would apply if someone was in a home or in some other form of care placement. If Jackie is a threat/risk to herself or others because of her behaviour or that the treatment/care required is such that being confined is preferable to allowing her to do as she wishes or just randomly in cases of Alzheimer’s (so it seems sometimes), then you could ask the Social Services to assess if it is correct that you lock her in the house (as my dad had to with my mum). The outcome should be a properly described and completed Deprivation of Liberty Safeguarding (DoLS) document. Similarly physical restraint for their own safety needs some form of documentation to make it immediately provable to anyone in authority that it is permissible whenever visits, say, to dentists/GP’s etc. become necessary….. DoLS responsibility is transferable to anyone that has a duty of care. Ergo, if you have to leave Jackie or a doctor takes over care, then the doctor/carer has to abide by the DoLS just as if they were you. So no document could become an issue if you are experiencing these sorts of situations. Sorry Barry, Social Services Adult Care is probably already involved with you. It is they that compile and take responsibility for DoLS…..
Deprivation of Liberty Safeguards (DoLS) tends to be used by nursing homes. However if you need to lock her in the house or restrict access to others then, look into it. The council might say no, but perhaps they will be trying to avoid the work. Intensity at the revue I said her skin should be severe but because I take such good care of her I had to put moderate, she said it would come under intensity, in your words so I can say to her next time what or how would you describe Intensity to her? I don’t know what she means by intensity. The skin. Was it previously a great risk to health? Was it your initial care that cleared it up? Is your current regimen the only thing keeping it at bay? If so the nature of the need for all that it is ‘well met’, is still a need. The matter of it being ‘Intense’ is the amount of time taken and the frequency with which care is required to meet the nature of the need. Could the need be better provided if you had assistance. (Even if you can’t get it). What you describe is not a so called ‘need of daily living’ and anyone that says otherwise should prove to you that they carry out such identical care for themselves at roughly the same levels and intervals that you provide to Jackie. ‘Intensity’ is about the quantity, severity and continuity of needs. Don’t forget that the criteria…. Intensity, complexity, unpredictability do not all have to appear for a need to indicate a primary health need. H Chris-G no her skin is perfect due to my taking good care of her it would be a risk to her health if I didn’t yes, it is only me and I have 2 carers coming for 3 hours a day and I have instructed them to move her every hour and check that she is dry yes, the nature is well met by myself I would consider it intense as you say for the constant monitoring. Would I be right in saying that? Look at the Skin section and consider what you and the carers do. By the nasty wound specific and not need specific wording you will likely only get Moderate. What you describe is not a so called ‘need of daily living’ and anyone that says otherwise should prove to you that they carry out such identical care for themselves at roughly the same levels and intervals that you provide to Jackie to prevent an obvious and dangerous outcome if not well met. Can you if you have time let me know if this is any good. It also may give others some ideas “What I would describe is not a so called ‘need of daily living’ and anyone that says otherwise should prove to me that they carry out such identical care for themselves at roughly the same levels and intervals that I provide for Jackie to prevent an obvious and dangerous outcome if not well met. (pressure soars urine burn). Roll her every 2 hours. Wash apply Zerobase and Carvilon after every pad change 3-4 times during the day. Same at least twice at night, roll every 2 hours. Check every half hour to see if she needs changing. Hi Chris-G, Jackie is as i said earlier at the end stages of alzhiemers and i have a review on the 14 Nov. I have scored Severe for Behaviour and Moderate for Skin, as i manage her skin so she has no pressure sores. Should i put Severe for Skin, as with out my well managed skilled care she would have pressure sores? Unless there are deep wounds that won’t respond, severe for skin is unlikely to be accepted. I know…. But they don’t ever let you get away with that. They want the problem and then the need exists. Your care is preventing the problem but it is not inevitable if your care was less attentive, if you get me….. That is how they work. Your high levels of care and attention do not mean that a lower level (less intense), would not have a similar effect. Hi Chris-G, would you recommend an Independent Mental Capacity Advocate to attend the next revue or arrange for one to come well in advance of the revue and then attend the meeting. Would you please accept my sincerest thanks for all your time and help, a lot of what you said I used at the last revue. It might be best to arrange one when you have the time and energy to do so. Sooner rather than later is best. To a degree you will have to ‘admit’ that you cannot make decisions with the lack of expert knowledge. The Independent Mental Capacity Advocate (IMCA) will (in conjunction with you), be able to make an assessment of the needs associated with mental incapacity. Don’t be afraid to ask if other needs seem to be exacerbated by the mental capacity issues. When they make their report that should include your observations too, review it and make your own further observations known so that if agreed, they can be added. If you feel that they could represent the mental capacity needs better or support your assertions then they can sit in on the Multidisciplinary Team too. They should also be allowed to remain during the ‘in private’ part of the assessment too. If the IMCA has never done so, it might be helpful if you explained the combative nature of assessors and the fact that they will cheat to maintain shrinking NHS budgets. Perhaps show them this site. At least that is how it went with our IMCA, a few years ago. There again, if they produce a report, it is entirely relevant to produce it at an (almost inevitable). subsequent appeals. The Continuing Healthcare team want to do a DoLS. I’m sure I read in one of your comments to watch out for them as they sometimes miss things off. What type of things would I need to watch out for? Hi Chris -G here we have another down score in drugs from Severe due to non-concordance placing them at risk of relapse. It’s the relapse they down-score, on saying it would be like stop the peg feeding but to me relapse can mean just about anything. Surely barry, the hospital/nursing home/GP should have instigated Fast Track in this case. The fast track actually short cuts the assessment for a while. The CCG will undertake an assessment shortly after being forced as it were, by the Fast Track application. Please remember that needs must be emphasised and not the causes of your wife’s decline. We had this very recently with my mum and we pushed the nursing home nurse to do this and then before sending it, we had her edit it a little to reflect need because she did not comprehend that was the essence of the Fast Track. Best Regards in this difficult time. Hi Chris-G Not sure what a need is I know they keep on about nursing needs ? Barry, As I almost always write…. Consider making a cup of tea. All of the constituent parts. All of the things that an outside influence (someone else’s or the patient’s need) could affect. Then apply complexity and/or intensity and/or unpredictability in completing this task. Consider also that it might be a genuine ongoing need requiring continuity that others without familiarity will have to match in providing the tea…… Now I could easily make you a cuppa because I can question you and you can answer to give me your current requirements for the beverage…. Unpredictability arises when you want coffee every now and then…. You can tell me all about that so your need is not particularly complex but is unpredictable of a regular tea drinker to suddenly require coffee. Especially so if your needs of daily living are already being met and your tea is already being offered. Now if every time I present you with a drink, you require a different one, then there is intensity because regardless of my frustration, I still have to meet the need, to get you a drink that you will actually consume. Now apply the nit picking and compare the nit picking with those criteria of complex, intense. unpredictable continuity to almost any need that your wife has. 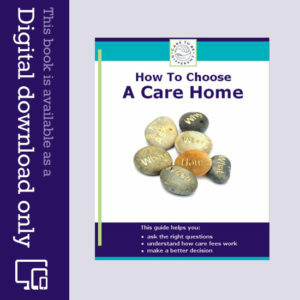 Don’t ever let anyone try to separate needs just because they consider them to be social care….. Hospitals provide cups of tea to the most challenging of patients….. They do it free, no charge. That is what is meant about need and the criteria against which they are measured. Ergo the more that a simple task entails to ensure it is done, the more complex, intense, unpredictable it becomes…. This is not just about the treatment of the disease etc. It is about identifying needs that are beyond a social worker’s legal ability to provide for. Remember that needs are not catered for in a vacuum….. Within residential accommodation there are usually others requiring identical servicing of their needs and as no one actually ever gets one to one care even if needs are beyond a council to provide, then it is likely that complex etc. needs will be even more complex etc. Hi Chris -G thank you so much for your help. At 76 the ole brain aint what it used to be coupled with Jackie my wife who is at the end stages of Alzheimers and I am her 24hour carer. She has no cognition, can’t weight bare ,has to be spoon fed, doubly incontinent ,aggressive, cannot communicate, medication covertly , so would you consider her needs as nursing? We got Continuing Healthcare (CHC) funding last year but everyone I talk to says they are trying to cut back. All I have is two girls in for three hours a day to do her personal care I have to do everything else for the rest of the 21 hours, all through the night as well. Any help on how I would present my case would be most appreciated . It is true that huge savings on Continuing Healthcare (CHC) funding are expected. How this is to be achieved without legally changing the criteria that indicates a funding need is beyond me. It would be to say that they will have to refuse funding to patient’s that last year on the same evidence, would have been entitled. This is crooked. Imagine if your local hospital refused to treat every second cancer patient on cost grounds. It couldn’t happen. So how can it happen in another part of the NHS? It is prejudicial to some patients requiring and qualifying for funding whilst allowing others with the same needs to get funding. That is madness. Back to your message: I don’t understand why you are not getting greater support from the NHS. Were your wife in a nursing home under the same CHC funding they would have to pay for 24/7 care and the accommodation too. I’m not suggesting a move by the way, but could you demand better care and longer attendances? In my area people are discharged from hospital into an NHS funded bed for 28 days to enable a Checklist and Continuing Healthcare assessment to take place. Sounds like a plan…….. Until of course one is already in a nursing home for which you have had your NHS Continuing Healthcare (CHC) funding removed. 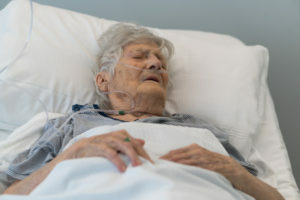 The hospitals seem to believe that all sick and recovering patients already within a nursing home that are sick enough to require repetitive hospital admissions, already receive CHC funding (because they are so sick??? ), and so they are simply sent home with even greater needs for funding than when they were previously funded or even as in my mother’s recent case, without any Fast Track or followed up palliative care….. Even having clearly been discharged to her care home to die……. The care she eventually received was only given once, (three weeks after discharge), we had demanded the discharge notes and then had a meeting and then got the GP who had clearly not read the discharge notes to do her job. Just a pity that pain relief and antibiotics etc. was not given as prescribed by the consultant for three weeks prior to my mum’s death. I have just received a response this morning from The Ombudsman where I complained that my mother was discharged from hospital with a package of 6 weeks intermediate care to a care home, which we were then charged for. The Ombudsman’s response is that the Council states on its website that they will not pay for ‘The Council’s policy on reablement says it will not accept referrals from people “needing long term support with no potential for improvement in their level of independence”. So the decision is no wrong doing by the council. I did point out the clause in the 2014 Care Act but to no avail. So it seems the Council decide not the Care Act. I am in disbelief. If the National Director of Operations and Information of the NHS, Matthew Swindells issues an instruction or an advice to the Clinical Commissioning Groups that demands or advocates illegal activity (https://www.england.nhs.uk/wp-content/uploads/2017/08/letter-improve-nhs-continuing-healthcare-assessment-processes.pdf ) by denying people who need nursing care access to those who are familiar with their condition, i.e. the nursing staff who have been dealing with them in hospital, surely anyone can take out an action against him. I’m game for setting up a fighting fund. Anyone feel the same? Thank you for this new information, it is invaluable. Furthermore, to last comment….. This is a CCG ‘Rubber Stamper’s’ charter. The hurry up is more important than health care and observation of and provision of care needs. I am also mystified as to the role of government in this, having apparently taken managerial responsibility for the NHS from the Secretary Of State some time ago, when it was restated that his role was only to provide an environment in which the NHS could function……. It appeared at the time to be a vehicle to enable the Sec’ to avoid blame by not being seen to actively manage the NHS. If so then why does this report mention his involvement? Imagine if you will what would happen if the Atomic Energy people circumvented rules and/or rubber stamped the recommendations regarding who would continue in custody of used nuclear fuel once they no longer have a use for it……….. would the fuel remain safe and secure? Would they be allowed to mess about with the laws and rules in such cavalier manner….. I sincerely doubt it. Neither Her Majesty’s Secretary of State for Health nor Her Majesty’s Government have had day to day managerial or operational responsibility for the National Health Service since the Health and Social Care Act 2012 came into force, mainly on 1 April 2013. Since 1 April 2013, in England day to day decision making concerning the National Health Service rests with the Chief Executive of NHS England and to those within NHS England to whom the Chief Executive delegates responsibility. And following the coming into force of the Care Act 2014 and secondary legislation The Care and Support (Discharge of Hospital Patients) Regulations 2014 (which secondary legislation has not been debated nor scrutinised by our MPs), are worded in such a manner that it seems NHS England is entitled to issue directives to CCGs like the one issued on 17 August 2017. An online article on 21 August 2017 suggests English local councils have also been contacted by the Department of Health. In summary, the article alleges the Department of Health has told local councils if they do not assist CCGs in speeding up hospital discharges they (local councils) may have their social care budgets further cut! Secondary legislation without proper oversight is an extremely bad way of implementing policy. Perhaps now only Her Majesty’s judges will be able to overturn this policy if it is affecting patients adversely. But who is going to be willing to take the Department of Health and/or NHS England to court? Angela is absolutely right. Those fighting to ensure that a proper and comprehensive assessment of their loved one’s needs for NHS Continuing Healthcare is conducted should follow Angela’s advice above and fight for what they believe is right. As you say Andrew, secondary legislation without oversight………. That is the entire NHS Continuing Healthcare process in a nutshell. The standing rules regulations are among the most recent of single minister created laws that Parliament does not read and vote upon……..
A good article based upon yet more cynical cost and service cutting. Interesting to see that my CCG has completed only 48% of Continuing Healthcare assessments within the mandated 28 days. Assuming that the Professor of Nursing is a Registered Nurse; what I wonder, would be the Nursing And Midwifery Council’s response to a complaint that a Nurse has signed off this document, much of it apparently ignoring the National Framework Guidance and the in so doing, ignoring law.